Many people want to achieve success as inventors; few actually do. Lee Fleming, Weatherhead professor of business administration at Harvard Business School, is studying whether someone’s position in a network seems to matter when it comes to determining who succeeds. Using data on all U.S. patents since 1975, his team mapped innovation networks for inventors across the country. The network of Harvard inventors who applied for patents between 2003 and 2008 is shown here, with larger nodes indicating that an inventor’s patents are frequently cited, i.e., influential; a connection between nodes indicates collaboration on an invention, measured when the inventors list themselves jointly on a patent application. 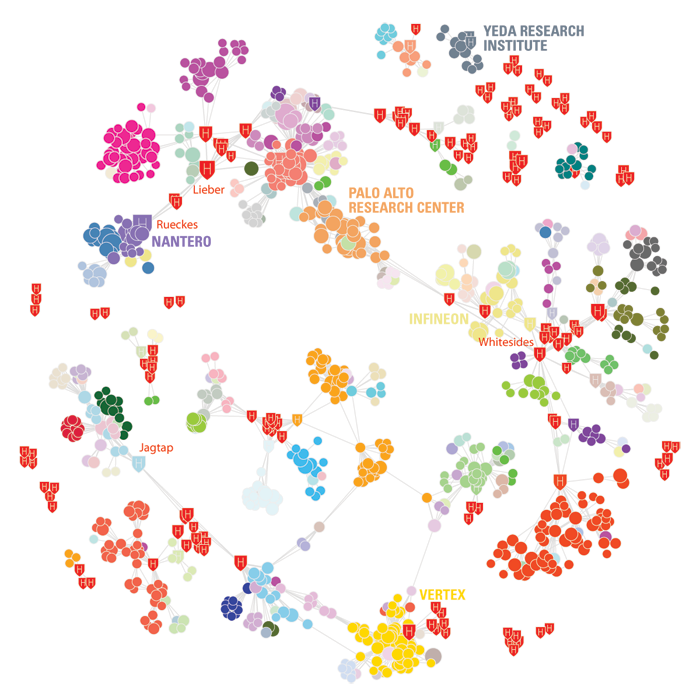 At a basic level, this map illustrates the global connections of Harvard inventors. They collaborate not only with each other, but with the distinguished Palo Alto Research Center in California; the multinational General Electric; and the Yeda Research Institute in Israel. They collaborate in a variety of domains: nanotechnology (Nantero), electronics (Infineon Technologies), and pharmaceuticals (Vertex). The database also enabled tracing inventor mobility, from firm to firm or university to university, across the last 35 years. Fleming and Matthew Marx, M.B.A. ’05, D.B.A. ’09 (now an assistant professor at MIT’s Sloan School of Management) determined that statewide enforcement of noncompete clauses--where companies bar employees from working for a competitor for a set period of time after leaving the employer in question--induce brain drain. States that enforce such clauses are particularly likely to lose their most productive and well-connected inventors, for whom opportunities in other states are easy to come by. An effort is under way to change Massachusetts law to prohibit the enforcement of these clauses--a change Fleming and Marx support.